Martin, A.M. (2005). A dog’s life: The autobiography of a stray. New York, NY: Scholastic. 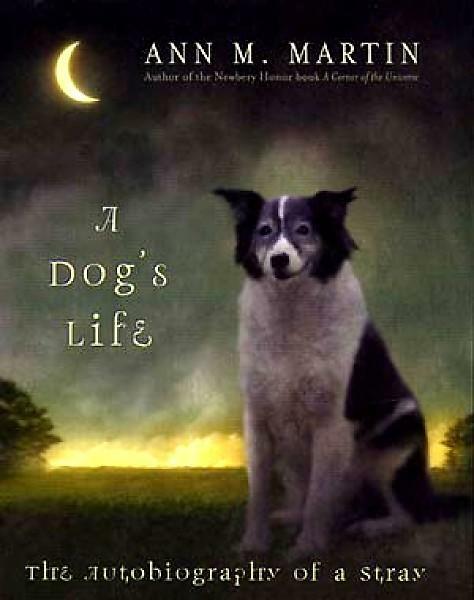 A Dog’s Life: The Autobiography of a Stray by Ann M. Martin is a story about Squirrel and her brother, Bone, who are stray dogs born in a shed behind a house. After their mother leaves them, they depart together for the unknown. Now being strays, Squirrel and her brother have to struggle a lot due to the cruelty of many people and could care less about them since they’re strays. Sadly, early in the story, Squirrel and Bone are separated, and Squirrel is entirely on alone. Luckily, she meets a dog named Moon that she mistakes as Bones. They become very close, but Moon ends up getting hit by a car and she is all alone once again. Squirrel goes through so much as a stray and people treat her differently, some cruel, some kind, a family takes her in but then leaves her behind, expect for one old woman later on in the story, that takes Squirrel in permanently and they live happily together as friends, as if what both have been searching for their entire life was each other. A Dog’s Life: The Autobiography of a Stray is sweet and sad, wonderful and heartbreaking, and don’t be surprised if you catch yourself smiling or crying while reading. The book has a wonderful plot, heart wrenching at times, and offers insight to the feelings of dogs and the importance of their encounters and interactions with humans as well as the strong relationships dogs make with one another. Squirrel, is a sweet, gentle female dog in which her story is told in the first person. Her life is filled with hardship, danger and loneliness, as she wanders from town to town. At the end she does find comfort and friendship when she meets an elderly woman who takes her in. It is then that these two souls find exactly what they have been searching for, each other. Readers who love dog stories will enjoy this heart-wrenching saga that thankfully has a beautiful ending. If you love dog book you may also love reading Erin Hunters (author of the Warriors series and the Seekers series) first book in the Survivors series, The Empty City, where dogs rule the world in a place where humans no longer exist.